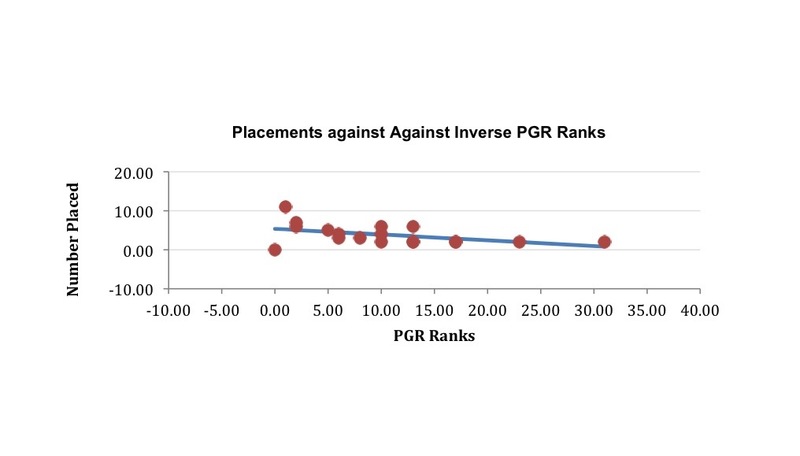 I excluded foreign graduate schools (which are ranked in their home jurisdictions, not against US programmes) and then did a multiple regression of placement numbers against inverse 2006 and 2014 PGR ranks (recklessly treating these, I know, as cardinal variables). As expected, the line slopes down slightly to the right–the lower-ranked a programme, the fewer people it placed in top departments. But not by much. The coefficient for the 2014 rankings is -0.15, and for 2006 it is -0.07, which you can pretty much see with your own eyeballs. And none of this is significant at p=.05, except the intercept (0bviously). A couple of comments. There are few data points. They are placement numbers; not success rates. This does not test the predictive power of PGR rankings: we would need to know about lower-ranked departments and about rejected candidates. We would want to add more independent variables. Still, this does not suggest that well-informed departments, when hiring to the tenure-stream, are in the thrall of the PGR. Apart from the very top-ranked departments–which, on anyone’s account are stellar and, whether by selection effect or treatment effect, turn out stellar candidates–lots of other places are about equally successful in elite placements. Not that elite job placements are the only thing, or even the main thing, to think about in life. Occupy (the right aspect of) the syllabus!